Of all the tasks associated with publishing a book, the most dreaded is book marketing. There are many reasons for this. It takes time away from writing. It’s hard to know what works. Marketing often feels like selling. Here’s how you can help: watch each video (even just a few seconds) and let me know which one you like better. As a thank you, I’ll randomly select one winner to receive a $10 Amazon gift card. 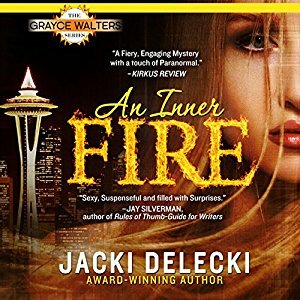 Jacki Delecki is the bestselling author of contemporary and Regency romantic suspense. For more information about her books, the Code Breakers series and the Grayce Walters series, visit www.JackiDelecki.com. Giveaway ends 11:59pm EST March 28th. Please supply your email in the post. You may use spaces or full text for security. (ex. jsmith at gmail dot com) If you do not wish to supply your email, or have trouble posting, please email maureen@justromanticsuspense.com with a subject title of JRS GIVEAWAY to be entered in the current giveaway. Unfortunately, the 1st link didn't work, so I watched the one with narrated soundtrack only. In general, I prefer musical soundtracks. I guess it has something to do with how I absorb information. Music & written text work better for me than narration. As for the second video itself, it was good but the narration wasn't very suspenseful. It needed some kind of edge. I definitely prefer the musical soundtrack, it felt more suspenseful while the narrated one felt more like commercial overhype. Perhaps it was the tone of voice or even the tenor of her voice, I prefer the musical trailer. I prefer the musical soundtrack. It creates suspense immediately and gives a flavor of the book. I prefer the musical soundtrack. I agree about the musical soundtrack. I guess I'm going to disagree with everybody, I prefer the narrated soundtrack. I prefer the one with the narrative. The music is nice, but tells you nothing about the book. I like the one with narrated soundtrack, it gives me what I'm curious to know about the book. I like the musical soundtrack, it caught my interest more than the narrated soundtrack.